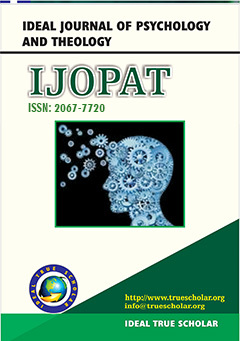 Ideal Journal of Psychology and Theology “IJOPAT” is an online International Journal of Psychology and Theology. It is a double blind, peer reviewed, open access referred Journal having a brand value among the world’s best Journals focusing on theories, methods and applications in Psychology and Theology. We publish peer reviewed manuscripts focusing on theoretical and empirical research in all areas of Psychology and Theology, etc. The journal welcomes the submission of manuscripts with the theoretical or empirical aspects of the above mentioned and related areas. IJOPAT is a highly-selective journal, covering topics that appeal to a broad readership of various branches of Psychology and Theology, and related fields. is a peer reviewed international journal with a key objective to provide the academic and industrial community a medium for presenting original cutting edge research related to all aspects of the journal, related areas and its applications. Our mission is to be a Centre of Excellence by offering strategic management consulting services, a global forum for innovation, conference organization, publication and collaboration at both local and international levels through and by the effort of recognizing outstanding scholarly and professional contributions of both individuals and organizations.